I think the fact that I thought I would never travel makes this worse. I never thought there would be a food I would miss because it would always be available to me. Since i have travelled there are so many foods that I can’t get at home and miss. I have tried and failed miserably to reproduce some of them and others I just have not even tried to do myself! I hope you have tried some of these and if you haven’t I hope you will give them a go next time you are travelling! This is my absolute favourite when we are travelling! If I see one I will try it! I have tried to have a pork knuckle here at home at different restaurants but they just are not the same. The best we have ever had is from the restaurant in Vienna called Schweizerhaus and it was simply the best! The rind was crunchy and the meat was so tender but most of all for me it was not too salty! Some can be absolutely huge so when ordering make sure its not one that is for two people, you may have bitten off more than you can chew if you order that one! The best one we had was in a small restaurant called O’Toxo in Barcelona. I loved the mix of chicken and seafood and it was so delicious! The one we had in Barcelona was seafood and chicken. It also had a chorizo in it but was not spicy at all. I can’t handle spicy food so it was really good for me! I have tried it at some markets here at home but it just doesn’t seem to get the flavours all together. One night Mark tried to make it and it was really nice but he has not attempted it again! Hint Hint Mark!! I honestly thought that ice cream was perfect the way it was but then we went to Rome! I remember seeing my first gelato shop and being amazed at all the different flavours they had! I seriously sampled so many different types as often as I could! Don’t be scared of trying the different flavours either…sometimes they work out the best! Ok I know it is not technically a food but you put fruit in it so that has to count for something, right? I have bought so many different types of Sangria while at home but none have hit that same spot! It may have been the hot days, it may have been the location, and enjoying a jug while relaxing on holiday makes it fun! My fav Polish food. I just love it! There are so many types you can try and every place makes it slightly different. The best we had was from a restaurant called Karczma Ochodzita. We can’t wait to get back there to have some more! 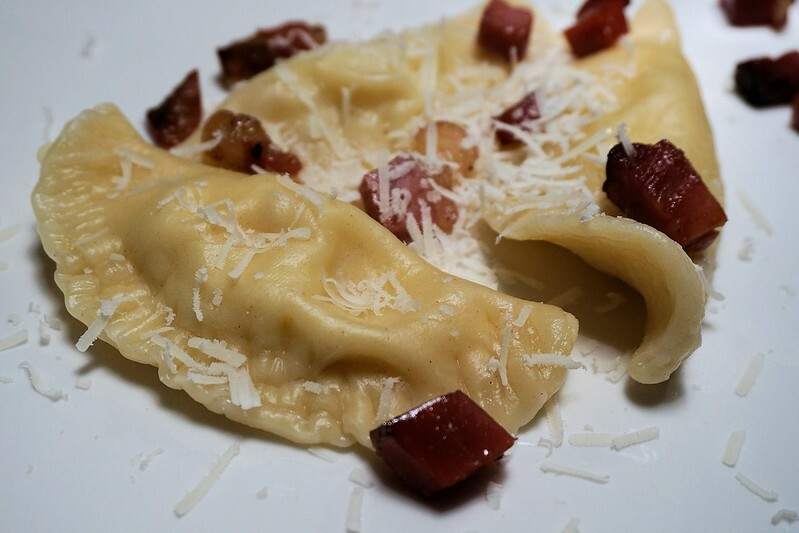 Pierogi are a little like dumplings that have an assortment of fillings. Our favourite was cabbage and mushroom. My first time having this was also with sheep’s cheese so it was a complete experience! We were staying in Hungary and we had a restaurant across from our apartment called Vendiak. It was a long time ago now (yes 2006) so I have no idea if it is still around but the food there was fantastic! They also had a chestnut puree that was divine! There is nothing better than walking around and picking up an amazing tasting baguette! We also found that it was one of the foods we could finally get Marley to eat. They are available everywhere so it was not a problem to get one…well until we left France! You can get anything on them anywhere you go! We loved the chicken, mayonaise and egg. Marley loved the ham and cheese! 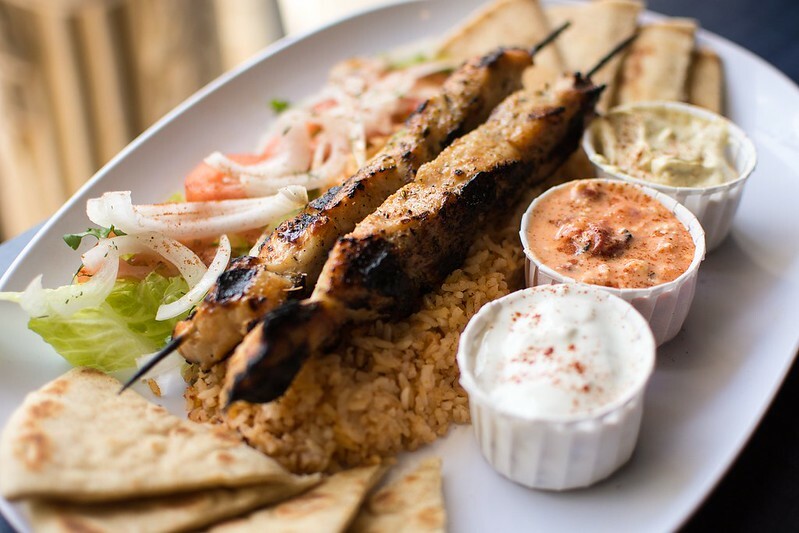 Oh my goodness, the kabab! There is an awesome Kabab shop in nearly every city we have been to! I love them so much and they are all so different. One of the best was in Munich on a freezing day and we had to take them back to our apartment as Marley had been playing in a fountain! They were just so good! Willow actually discovered these tapas Cod cakes while we were in Lisbon. She desperately wanted to try them and neither Mark or myself were keen at all. The waiter saw that she wanted to try them and bought her out one to try and we were all hooked! They are so tasty and melt in your mouth. 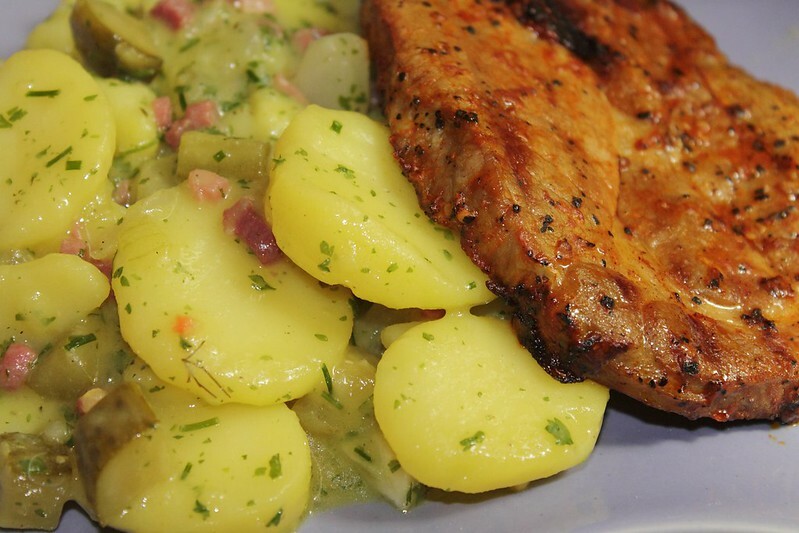 There is nothing better than a German potato salad that comes with your meal. They can be mild, creamy, they can make your tongue fizzle from the vinegar but most of all they are delicious! There are so many different kinds that it is hard to say where we have had the best but if you are getting a meal grab some and see what you think! I think one of my biggest travelling mistakes was that I didn’t give it all a go when I first went over. I missed the most beautiful pastries in Paris, Schnitzel in Germany and who knows what else! Now nothing stops me from having a go at something new! OK WOW! Those pictures just made me water AND miss all those European cuisines! I absolute love pierogi and couldn’t have enough of them while I was in Poland! 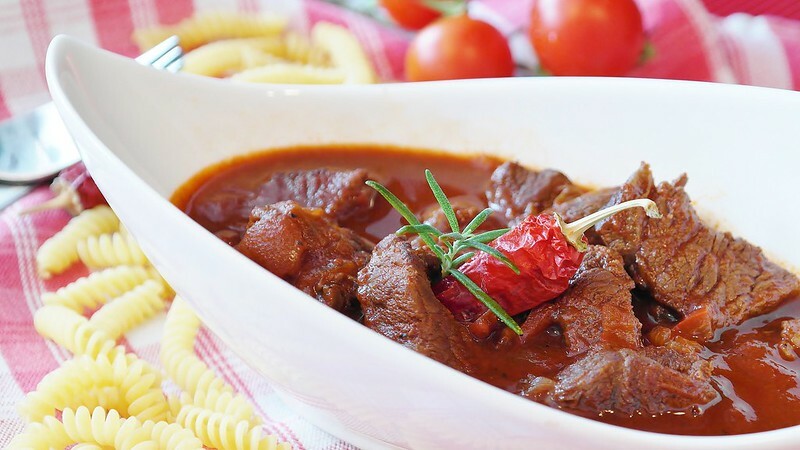 Goulash is also a favourite, I love the taste of the Hungarian paprika hmm.. I agree, I agree and I agree again. Ahhh I love so many of the foods you have listed. 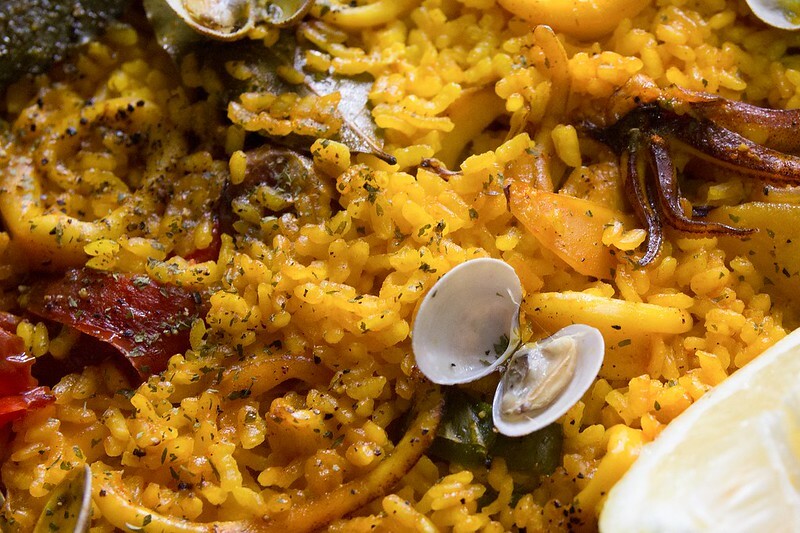 I must say my favourite is definitely Paella… and there is nothing better than to try it in Spain with some fresh seafood. And I love goulash as well – YUM! This post has definitely gotten me very hungry but I am pinning it! Happily surprised that I’ve tried 7 out of 9 of these! Awesome list! Bring on Euro 2017, pork knuckle & cod cakes, I’m coming for you! All the food looks so delicious ! Pork Knuckle looks appetizing , would surely try it. Everything sounds delicious (but the seafood) 😉 I grew up eating German Potato Salad from my German heritage. I haven’t had homemade in years. Now I WANT some! haha I hope to try real Hungarian Goulash on day too. I will definitely try the chestnut puree!! Thanks for sharing such tasty foods. This post has made me hungry. But more importantly, I am glad Sangria made the list!!! Pierogis are one of my favorite foods. It is really a shame I have not tasted them from Poland. It’s on the bucket list though. 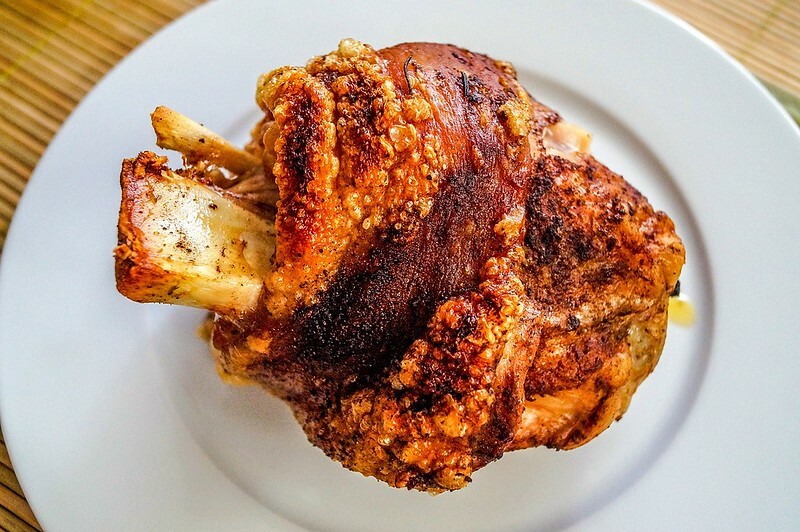 You had me at pork knuckle~ that looks amazing! There is not one food here that you have featured that I do not want to experience. And of course, I’m now hungry! Great list and I bet you’ll have more to add after your travels this winter. For gelato in Rome, we enjoyed the Grom at Via Della Maddalena http://www.grom.it/en/gelaterie.php. Very central and nice selection of flavors, plus restrooms which was nice. These all look delish! I can say I have tried all except the cod cakes, interesting. I love that you included some Eastern European classics like Pierogi and Goulash, they are both delicious. Nice list! As I live in Europe, I have already tasted many dishes of the list (kabab, gelato, sangria, baguette, goulash…) and they’re all delicious! I would really love to try pierogi one time, it looks very tasty. Oh man, I’m glad I had already eaten lunch when I read this or I would have been running around trying to find all of these! Oh man, YES to all of this! I just got hungry thinking of all the food. I used to eat Paella on the regular in Spain, and there was even this gelato shop I liked to wait in in the winter (gelato + heating haha). And Sangria! Best deal with tapas is at El Tigre off Gran Via in Madrid, so good and a ton of tapas! Definitely need to try the rest of this list! Yum! I’ve tried most of these, but the idea of pork knuckle never really appealed to me. Seeing that photo and reading your description may have changed my mind though. I’m glad I’m reading this before having my breakfast 🙂 One of my regrets is not sampling gelato when I was in Italy over 10 years ago. We have gelato shops in Ireland with an amazing array of flavours but I often wonder if they are the same. I recently tried wildflower, honey and lavender gelato at Butchart Gardens in Victoria, BC. Divine!!! I’ve lived in Germany for about 5 years now and have never tried a Schnitzel…. I definitely will give it a go soon!